The 11th annual forum of the Cement Sustainability Initiative (CSI) has taken place in New Delhi, India. The forum was hosted by Dalmia Bharat Cement and UltraTech Cement, in partnership with other Indian and global members of the CSI, and the Cement Manufacturers’ Association of India. The meeting focused on the UN's Sustainability Development Goals (SDGs), emphasising the areas that are most relevant and critical for the cement and concrete sectors. SDGs were adopted in September 2015 by 193 UN member states and layout a plan to address current socio-economic, environmental, and societal challenges. 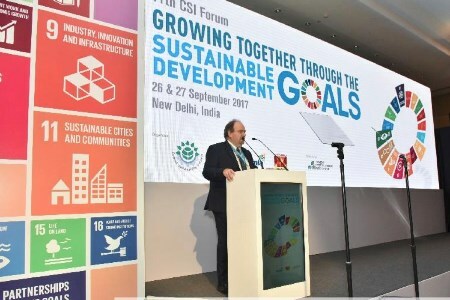 “The SDGs provide a structures framework to further enhance the good work that has already been done by the cement sector,” said Philippe Fonta, Managing Director of the World Business Council for Sustainability Development, of which the CSI is a part. As part of the meeting, the forum examined and evaluated the new framework set up by the SDGs to tackle the sustainability challenges that businesses and societies must face together. It also explored areas where the cement and concrete industry could engage with the SDGs. “The SDGs mirror an image of a happy, healthy, safe, auspicious, and peaceful world envisioned in our sacred books as far back as 2000 BC,” said Mahendra Singhi, Group CEO (Cement) of Dalmia Bharat Cement.